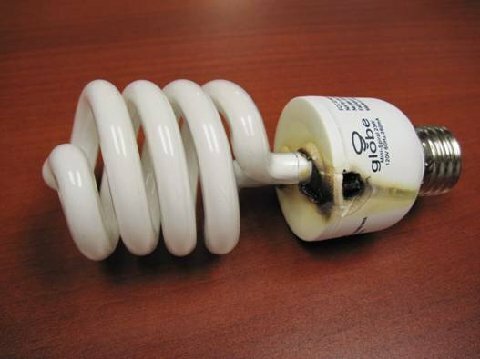 CFL Bulbs Have Their Lion share of Problems…Check This Out! Thanks to Richard for this one…The message below from (Original source) provides us with very important information about CFL light bulbs made (Globe) in China. Please read the message and forward it to others that you know. It could save your house from burning and the lives of those inside your house. Upon doing some Internet research, it seems that bulbs made by“Globe” in China seem to have the lion’s share of problems. Lots of fires have been blamed on misuse of CFL bulbs, like using them in recessed lighting, pot lights, dimmers or in track lighting. Mine was installed in a normal light socket. I bought these at Wal-Mart. I will be removing all the Globe bulbs from my house. CFL bulbs are a great energy saver but make sure you buy a name brand like Sylvania , Phillips or GEand not the ones from China .